Custom cookies with your company’s logo are a unique way to promote your business. Indulge your client's sweet tooth and give them another reason to remember your brand fondly. Get your company logo and name screen printed on a variety of promotional cookies. For a truly delicious gift, you can work with our experts to create custom messages for fortune cookies. These edible delights make the perfect gift for your next company party or giveaway! Contact us today to learn how we can help your company or organization. Make your favorite campfire treat in the microwave with this Mini S'mores Gable Box Custom Kit! Enjoy a S'more without the hassle of bugs or campfire smoke. This kit comes with everything you need! Wrap your logo around these decadent chocolate custom candy treats wrapped around a mini sandwich cookie. Round Custom Chocolate Covered Cookie - .75 oz. Sweeten up your next promotion with these delicious custom chocolate covered cookies in a cello wrap. Rectangle Custom Chocolate Covered Cookie - 1.25 oz. This Gourmet Cookie Custom Gift Crate features 9 unique varieties of delicious cookies! They arrive in a large crate, firebranded with your logo. We've got the Sweetest ways to promote your company or event! These Mrs. Fields Perfect Promo Cookies make unforgettable promotional tools, trade-show giveaways or party favors. Increase your tradeshow traffic by giving out custom-labeled Oreo custom cookies covered in smooth Belgian white chocolate. Increase your tradeshow traffic by giving out custom-labeled Oreo custom cookies covered in smooth Belgian milk chocolate. Increase your tradeshow traffic by giving out custom-labeled Oreo custom cookies covered in smooth Belgian dark chocolate. This Gourmet Cookie Custom Gift Box is full of a delicious assortment of cookies. Customize this entire box with your logo and branding, it's a blank canvas just waiting to be painted! Thick and chewy home-style chocolate chunk custom cookies are custom labeled and are great for tradeshow handouts, company events, and sales calls. Have your next promotion be a mouth-watering hit with these Full Color Promotional Shortbread Cookies! These cookies are individually wrapped and made in the USA, making them a great event product. At just under 1 pound this giant promo fortune cookie brings to you a big delicious promotional treat. This Full Color Emoji Chocolate Covered Custom Oreo w/ Stick is going to put a smile on your clients face! Covered in white chocolate, this sweet treat is sure to increase your trade show traffic. Satisfy everyone's sweet tooth with this Gourmet Cookie Gift Bag that displays your full-color imprint on the custom hang tag! Show your appreciation with delicious chocolate chunk cookies. A promotional Clif Bar is the original energy bar made with organic ingredients that delivers an optimal blend of nutrition for sustained energy. Promotional cookies are a perfect gift for the holiday season with your choice of chocolate chip cookies or a mixed variety of cookies. Sweet promo tins of your choice of a variety of fresh baked promotional cookies fit for royalty. Gourmet Custom Cookies in Collector Gift Tin - 18 pcs. Gourmet Custom Cookies in a Collector gift tin makes a classic gift! Business Card w/ Custom Chocolate Covered Cookie - 1.75 oz. Sweeten up the business deal with these delicious custom chocolate covered cookies in a business card box. Perfect for tradeshows and events! Deliver your promotional message with these Full Color Custom Fortune Cookies! Chocolate Covered Oreo Promo Cookie in Collector Tin - 18 pcs. These promo cookie collector tins offer a delicious opportunity to promote your brand, introduce new products or thank your special clients. Who can say not to a traditional promotional gift tin of gourmet cookies? Gourmet Cookies in Custom Gift Box - 21 pcs. These delightful gourmet cookies in a custom gift box makes a classic holiday gift! This promotional greeting card comes with a two individually wrapped promo cookies is a sweet way to promote your company to new clients. You'll taste perfection when you sample Oreo custom cookies that are covered in three different types of chocolate. What better way to promote your company than with this delicious Chocolate Chip Cookie Promotional Mix. These custom fortune cookies are a promotion that's sure to bring good fortune to your logo or message! A campfire favorite in a compact size, these delightful promotional snacks are packaged in a custom promotional tube. Dipped in divine dark chocolate and decorated in red, white and blue stars for a perfectly patriotic custom fortune cookie. Elegant giant custom fortune cookies dipped in tasty white chocolate and decorated in multi-colored sprinkles to enhance your full color edible logo or design. Your choice of approximately 16 gourmet chocolate chip cookies or approximately 16 assorted cookies in custom tins with logo. Picture this, completely customized promotional printed cookies with an edible photo image and colorful confetti decoration! The perfect corporate calling card, hand out these world famous promotional cookies by Mrs. Fields ®. Animal Crackers Promo Cookies Individual Packs - 1 oz. Inexpensive way to "round out" your brand image with fun promo cookies Animal Crackers. Are you deciding on what the best bang for your marketing buck will be? Advertise your business with cookies! At ePromos, we guarantee your customers will love our custom logo cookies. Think about your next big corporate meeting. Wouldn’t it be great to serve customized cookies and a refreshment between agenda topics? Keep guests in your waiting room happy with edible business cards. With so many sweet options, the possibilities are endless. We have full-color promotional cookies that will be the sweetest way to entice individuals to your tradeshow booth. These promo cookies will make your company unforgettable! After all, people who are helping themselves to cookies will see your company name. A box of custom cookies is a great way to thank your employees or customers during the holiday season. But of course, you can reach your customer’s hearts through their stomachs any time of the year. We have gourmet cookies that are individually bagged or packaged 3-in-a-bag. Mix and match your favorite cookies, creating custom sugar cookies, snickerdoodles, white chocolate macadamia, chocolate chuck or classic chocolate chip cookies. These tasty snacks give customers a tiny taste of what they can expect when the conduct business with your company. These sweet bundles are professionally wrapped so that your logo is always clear. We have tins packed to perfection with cookies that are super fresh and taste delicious. Trust us, the scrumptious line of food gifts at ePromos are the best you can find online! 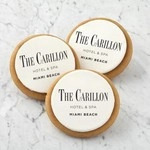 Logo cookies are a delicious way to advertise your business to potential customers. We have personalized fortune cookies…and they are anything but ordinary. Create your own custom messages to delight and inspire your customers and clients. Custom made, you can put your logo, company message, or favorite corporate joke in place of the fortune's lucky numbers. Motivate your employees by giving them sweet rewards for meeting their sales goals. ePromos lets you order mini branded cookies to make your best salesperson's even happier. Can't find what you are looking for? Do you need some inspiration? Custom cookies are a mouthwatering way to make a sweet impression on potential customers. Our Brand Consultants are the Promo-Know-How experts. They can help you with some of the leg work.